Few couples are bold enough to experiment with bright and big splashes of color, when planning their wedding day. We, however, believe that weddings deserve to be celebrated with great pomp and show. After all, they are a once-in-a-lifetime affair. Bright colors add a festive note to any regular event. 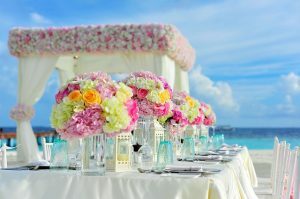 Colorful wedding themes have a distinct personality that make them memorable. So, we think bright pops of colors are exuberant and cheerful, and are perfect to create a joyous vibe for the new chapter of your life. So, here are some ideas to add a stunning dash of color to your wedding day. Even if you choose a sophisticated wedding color theme, borrow some of these ideas to add a refreshing pop or color to the scheme. Anything suspended above eye level is instantly interesting. So, use streamers and buntings to add a cheerful note of color to your wedding hall. Mix up colors of the rainbow to create pretty motifs for your streamers or buntings. Then suspend them from hooks on the walls or stretch them across the entire length of the ceiling. Any dreary colorless ceiling will instantly pop with this idea. Not only will it be visually appealing, it will also stay out-of-the way and still look fantastic. Impress your guests right from the beginning with a brightly colored invitation to get the party started. 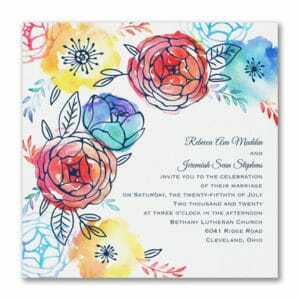 Vivid floral details, bright geometric prints and refreshing colors look fascinating on invitations. You can also explore funky prints and polka dot patterns for a buoyant effect. Customize your invitation card with colored ink and pretty calligraphy to nail the details. Featured here is a stunning sample from our invitation suite at Best for Bride from Carlson Crafts. Visit this link to find out more details about this invitation. White forms the ideal background against which bright colors really pop. To make your tablescapes stand out, choose saturated colors in lavish doses. Meanwhile keep the table covers white or light. This will enhance the colors and make them appear brighter than they actually are. Take a look at this image, for instance. The intensity of the pink and yellow flowers is enhanced because they are set against a white background. With the bright blue waters of the ocean in the background, this setting is simply heavenly! Don’t you agree? Drinks and beverages are an easy way to add a delectable pop of color to any setting. Not only do colorful drinks look tantalizing, they also contribute to the visual scenery in terms of color. 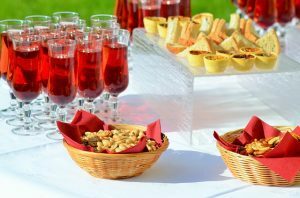 Place the drinks on tables or distribute color throughout the setting in several beverage stations. Either way, this is a good idea to add small but vivid doses of color to your décor. Complete the effect by adding flowers or décor elements in similar or complementing colors. This will also look very pretty in your photos. Take a look at the image here, and you will get the idea! Having trouble finding the right cocktail for your preferred color scheme? Head over to the Elledecor website by clicking this link, for drinks as pretty as your party décor. 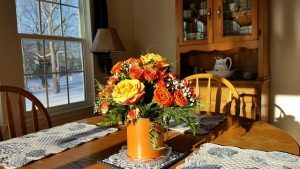 Summery hues like yellow, orange, red and blue are best brought out by floral arrangements. Whether you limit it to just a few scattered pieces or fill the entire space with lush and colorful flower arrangements, this will add a welcoming note to your tables. Enhance the brightness of these flowers by setting them up in copper-colored or monochromatic colored vases that match the color of the flowers. The contrast will increase the intensity of the colors in the floral décor. It is also a good idea to plan the flower arrangement with colors that are close to each other or on opposite sides of the color wheel. Visit this article on the Better Homes and Gardens website for an array of impressive bouquet combinations that instantly impress. Paper lanterns are a lovely décor element that can add a romantic and fun vibe to any setting. Suspended from the ceiling, they create a whimsical feel. Use them with the streamers we spoke about earlier, or on their own. 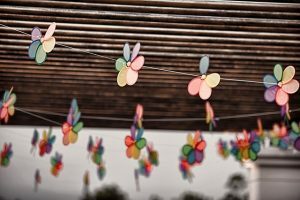 If you want to go all out, scatter them around your party venue and they will resemble little bobs hanging from the sky. 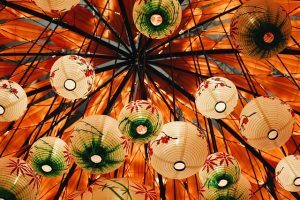 Or create collections of these lanterns at selected locations throughout your party hall for sudden bursts of color and texture. Mix and match lanterns of various sizes, shapes and prints to make them more interesting. If you wish to have just one statement piece of stunning color at your wedding, let it be your wedding cake! A tiered cake drenched in color is a magnificent sight; one that is impressive and memorable! Choose bright, bold colors for the base and accents and play with a range of textures at each level. This will enhance the splendor of the cake. Also choose a befitting cake topper that will complement the colors and details on your cake. Choose details that stand out, and your guests will not be able to resist taking pictures of it. 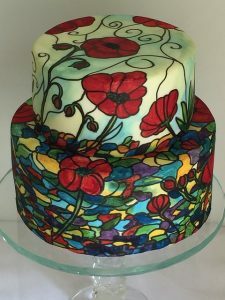 For an overdose of color, you can also have the inside of the cake colored. Choose rainbow, red velvet or ombre details for the inside to complete the overall effect. For inspiration on designing your cake, we suggest that you take a look at the colorful collection of cakes at the Martha Stewart website. Here is an easy way to make your bridesmaids look unique, while keeping their dressing style the same. Use different bright colors in their bouquets. This is most effective when the colors of their dresses are the same and the design details are similar. So, the bouquets will pop against the identical background and be a statement in itself. This idea best works against neutral colors like black, white, navy or brown. The alternative is to use a variety of colors in another accessory, like shoes or belts. Dress your bridesmaids in printed dresses in tropical colors and make your wedding scenery colorful and attractive. This is also an option to choose dresses that suit the individuality of each of your bridesmaids. They will appreciate the choice. But more importantly, they will also use the dresses more than just on this occasion. 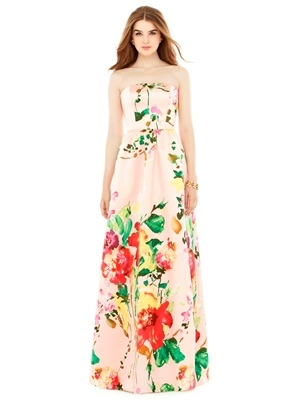 Summery prints on frocks look amazing at garden weddings and weddings on the beach. Check out our bridesmaids summer dress collections and you will find a variety of prints to choose from, for your special girls. The dress featured here is from the Alfred Sung Bridesmaid dress collection at Best for Bride. There are more designs in a variety of colors and various dress styles available in the various other collections at Best for Bride. Add a dash of color to your bridal look with a bright lip color. Keep the rest of the bridal makeup in natural tones and simple colors, while you pick a vivid shade just for your lips. Depending on your complexion, choose from pink, red or brown so it flatters your skin tone. Then flash your dazzling smile, and enjoy the attention that your wedding guests lavish on you. Show off your penchant for color by picking a non-conventional, colored wedding dress for your wedding. Or, if you want to play it safe, pair your dress with a colorful accessory or choose a dress with a colorful accent that doesn’t go unnoticed. Take a look at this dress from the Alfred Angelo wedding dress collection. The pleated organza skirt of this beautiful summery wedding dress is adorned with a scattering of bright pink roses. Additionally the pink waistband and bow make it really fun and romantic. Although unconventional, this dress is a delightful choice and is bound to be remembered by your guests in the years to come. Here is another dress from the Sans Pareil bridal collection with a colorful bodice. The contrast of the yoke with the white skirt is vivid, which makes it a wonderful choice for a pop of color in your bridal attire. Other options to add color to your bridal dress include wearing a colorful sash or waistband. You can also choose colored gemstone jewelry, if you prefer the age-old tradition of wearing all-white on your wedding day. An accessory that works like a dream and brings a colorful punch to your wedding outfit, a flower crown is a perfect addition to your wedding ensemble. Pick blooms that will not wilt easily so you look fresh throughout the day. Your florist should be able to make a flower crown that matches the details in your bouquet. Then, the two will come together beautifully. Or go with artificial flowers in your flower crown to stay safe if your wedding is outdoors. Choose a colorful backdrop for your wedding ceremony and it will be a signature element. You can achieve the intended effect using suitable fabric, lighting or other décor elements. If you do not want to have too much color, you can also consider adding an arch with brightly colored décor elements. This could be balloons, flowers, paper décor or foliage. 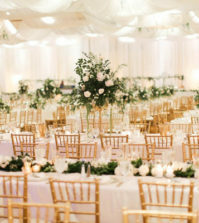 Or decorate the chairs with bright ribbons or chair backs for a pop of color. 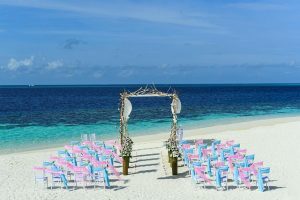 In this setting, notice how the pink and blue ribbons on the white chairs add a festive note to the overall arrangement. Despite the limited use of color, the image is distinctly colorful and vibrant from the use of this simple décor accessory. We also think this idea on the Huff Post of adding a framed piece of art at the altar is brilliant. Line up your wedding favors on a table and make it a powerful display by choosing the brightest colors possible. 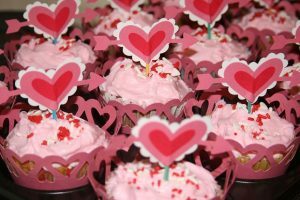 For edible favors, choose items with colorful frosting or pack them into colorful containers or packaging. For non-edible favors, pick items that make a pretty display. Then stack them together to emphasize the color component of the display. Or choose vibrant colored packaging that will impress and be noticed easily for the bright hues in them. A candy buffet, as a stand-alone element, can add plenty of color to your party. Design it with delicious treats and choose them in colors you love. 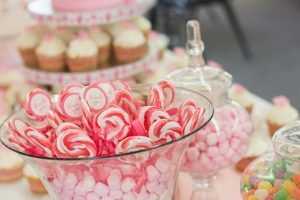 With options to customize wrappers with colors and prints of your liking, it is easy to custom create a candy buffet that is both colorful and inviting. Add this to your reception décor or set it up at the entrance to the venue. It will make a remarkable display and looks beautiful in photographs. From adding splashes of color to your bridal look, to coloring your venue with décor and accessories, we have covered a number of ways in which you can dress up your wedding with color. So, now tell us which of these ideas do you like and intend to embrace for your wedding day? For more wedding planning tips, advice and ideas, keep visiting us here at the Best for Bride blog page. And for more information on our vast inventory of wedding dresses, bridesmaids outfits, dresses for the wedding party and our range of wedding day services, visit the Best for Bride website today. Its all about those colors. I am not going for the 100% traditional wedding white with everything. I want to see popping colors with natural light! At first, I would have loved having more colorful dresses, but I like the idea of going after the flowers and even the cake decoration. Great tips! I really like all of these ideas. 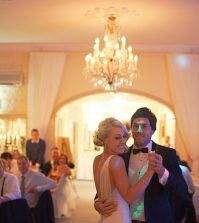 They are subtle ways to add color to a wedding day, without changing the entire theme of the wedding.